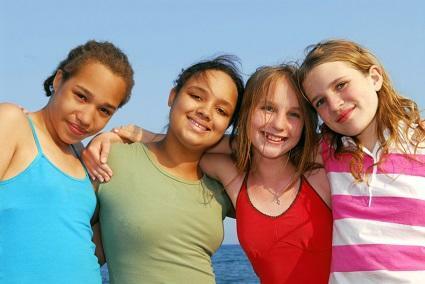 Puberty can be a difficult and emotional process for young girls, but understanding the stages may help them get through the experience. A British physician named James Tanner came up with five distinctive stages of puberty, known as the Tanner Scale or Tanner Stages, to help doctors and parents recognize which part of the process children are going through. Breast buds will form first, followed by an increase in the size of the areola. Some girls will experience significant breast growth during this stage, but for most, it will hold off for another year or two. Premature puberty - child begins to show signs of puberty before 8 or 9 years of age. A young girl going through puberty must deal with physical and hormonal changes to her body. On top of that, she now has to deal with acne, body odor and eventually menstruation. A little education about the stages she's going through and a bit of understanding from a caring parent or care giver can go a long way toward helping her through this difficult but exciting time in her life.